IBM researchers have announced a breakthrough in a new kind of memory, known as phase-change memory (PCM), that allows them to reliably store multiple bits of data per cell for extended periods of time at speeds several times faster than today's flash chips. 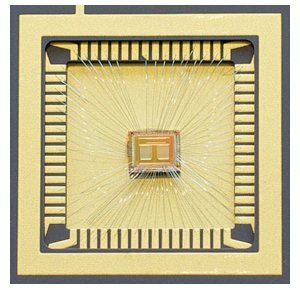 Though the company is not the first to demonstrate multi-bit cell phase change memory, it managed to sidestep a persisting problem called "drift" that otherwise causes data errors the longer data is stored. PCM works by storing data in small cells of chalcogenide, a special compound that can change physical states between crystalline and amorphous with the application of heat. It is "RAM-like" in the sense that bits can be changed individually, not only in blocks as required by NAND and NOR, yet it is non-volatile so power isn't required to keep the data in memory. This also means PCM will be much more efficient as it doesn't need continuous power to function. Yet one of the problems with multi-bit PCM is that, over time, the electrons in the phase-change cells tend to 'drift around', which causes the resistance levels in the chip circuitry to change and leads to data read errors. To overcome that issue, IBM researchers applied an advanced modulation coding technique that can correct for drift-based errors, and demonstrated the results by reliably reading out data from a 200,000-cell phase-change memory array several months after being stored. Of course, that reliability timescale needs to come up to several years before PCM can be commercialized, but IBM believes is on track to have the technology ready for use in servers by 2016. Other companies working on making phase-change memory viable include Numonyx, Intel's memory joint venture with STMicroelectonics that was acquired by Micron. The company began marketing a PCM product last year under the Omneo brand, promising write speeds 300 times faster than flash along with ten times more write endurance.